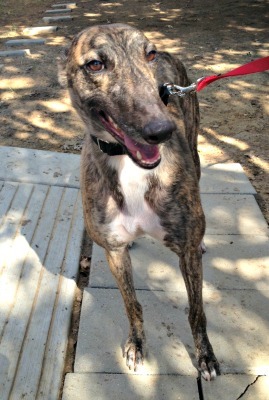 Mocha is a 16-month-old brindle female born born May 15, 2012. She was not individually registered with the NGA, but her sire is Super Lee and her dam is CTW Marguerite. Mocha was at a schooling farm, but has not raced. She joined GALT when her owner could not pay the boarding fees at the farm. Mocha, Latte, and Espressa are littermates. Mocha has passed an initial cat test, but needs to spend time with them in a foster home.